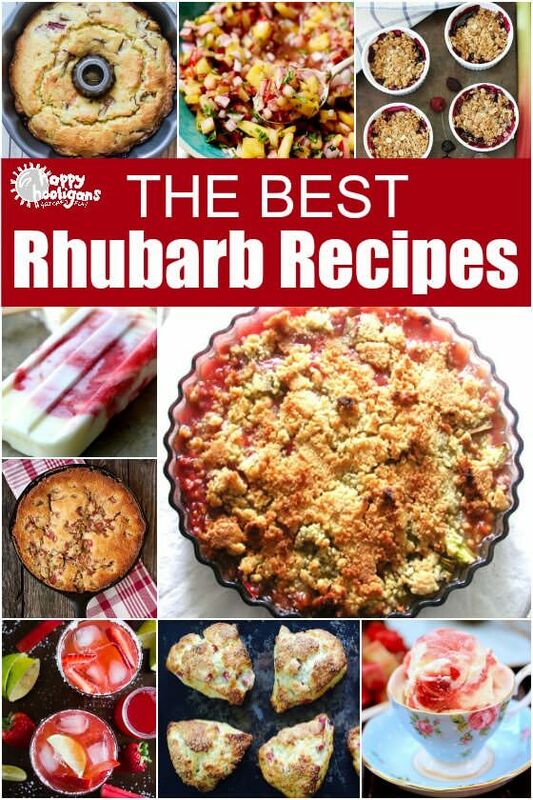 Some of the best rhubarb recipes take you right back to your childhood, like rhubarb crisp, rhubarb pie and strawberry-rhubarb sauce, but there are lots of exciting ways to use rhubarb that you likely haven’t thought of before. I’ve rounded up some of my favourite easy rhubarb recipes along with some new ones so you can put a dent in the bumper patch of rhubarb that’s likely at its peak in your garden right now. One of my favourite things about spring in the garden is our rhubarb patch. It doesn’t matter how much I ignore it, as long as someone (ahem) doesn’t run over it with the lawnmower (ok, that only happened once), it always produces a generous crop. 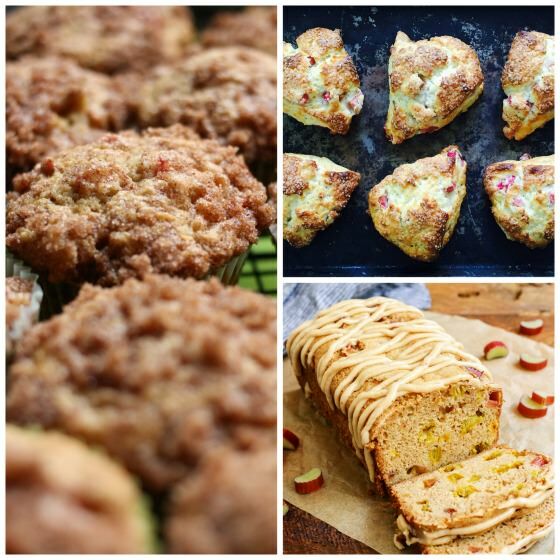 I do a lot of baking with fresh rhubarb in the spring and early summer, making sauces and muffins and cakes. In fact, I often deplete my own rhubarb patch and have to resort to harvesting more from my neighbour’s garden. If I happen to have any left at the end of the season, I chop it up and freeze it so it doesn’t go to waste. I have a couple of easy rhubarb recipes that have been favourites at our house for years, but I’m always up for trying out new ways to use rhubarb. I’ve hit on some winners over the years but I thought it would be fun to find some new recipes to try this summer. I’m most excited about the rhubarb salsa and rhubarb soup! 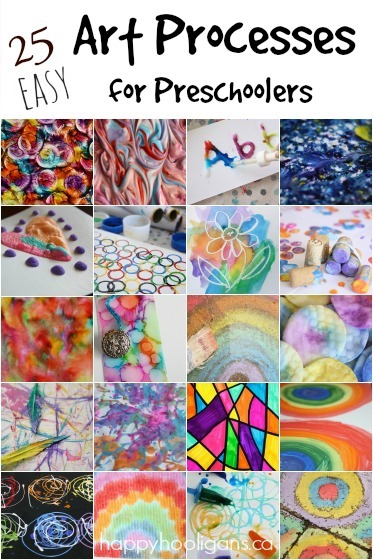 I’ve compiled them all here so I can quickly find them when I need them, and I thought you might like to see them too. If you’re looking for new, delicious things to make with rhubarb, you’ll find all kinds of yummy ideas here. 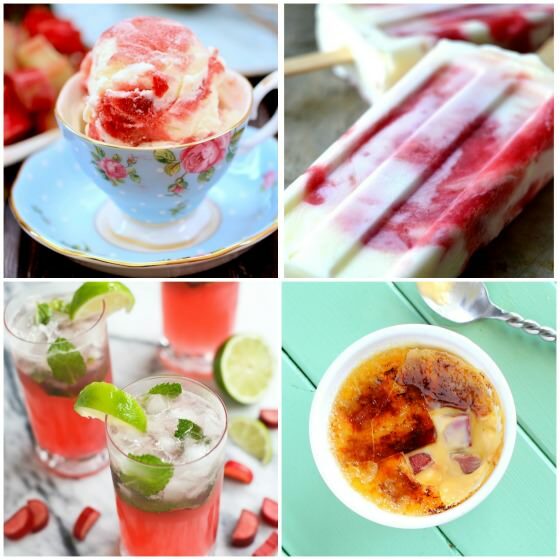 We have rhubarb cakes, crisps and crumbles, rhubarb drinks and frozen desserts, rhubarb cookies and bars, rhubarb salsas and appetizers and more. There’s even a chilled rhubarb soup and a rhubarb creme brûlée. Whether you’re baking for the family or a pot luck, or doing some summertime entertaining, there’s no reason not to try one of these rhubarb recipes this year. This easy rhubarb cake recipe has been in our family for years, and it’s my all-time favourite thing to make with fresh rhubarb. This is one of those simple, classic cakes that everyone loves. Topped with a cinnamon-sugar topping, it’s a perfect summertime dessert or snacking cake. Who knew rhubarb could look so elegant? This Rhubarb Custard Magic Cake would be perfect for even your finest summer entertaining. The “magic” happens when you bake this cake. It magically splits itself into three layers! According to its creator, “The top is like a sponge cake, the center a creamy custard, and the bottom a chewy fudge.” Doesn’t that sound heavenly? When I was a kid, my mom made peach upside-down cake and pineapple upside-down cake, but truth be told, I wasn’t a big fan. They were just too syrupy-sweet for my liking. An upside-down cake like this Rhubarb Upside-Down Cake would’ve been a different story. This sounds like the perfect combination of tart and tangy and buttery sweet right here, my friends. I’m adding this to my list of things to make with rhubarb when my backyard crop is ready. I do love to serve a bundt cake when I have company because you don’t have to make a frosting. 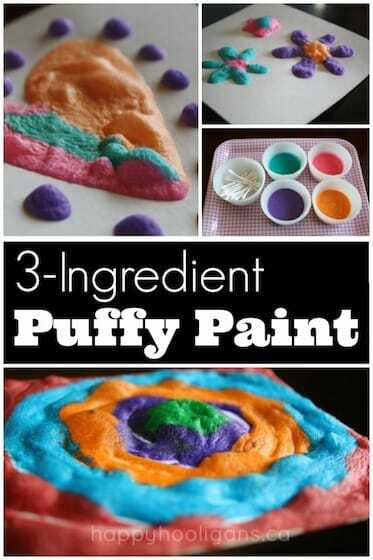 You can just dust it with icing sugar or drizzle a glaze over it to make it look fancy. For some reason, bundt cake always seems like an acceptable breakfast cake to me too, so there’s that. This lemon-rhubarb bundt cake calls for 3 cups of fresh rhubarb, so it’s a delicious way to put a dent in your rhubarb crop this spring. If you have a rhubarb patch in your yard, you need a simple rhubarb sauce recipe like this one. Rhubarb sauce is so quick and easy to make with fresh or frozen rhubarb, and you can always toss in another fruit too – strawberries, raspberries, peaches etc. 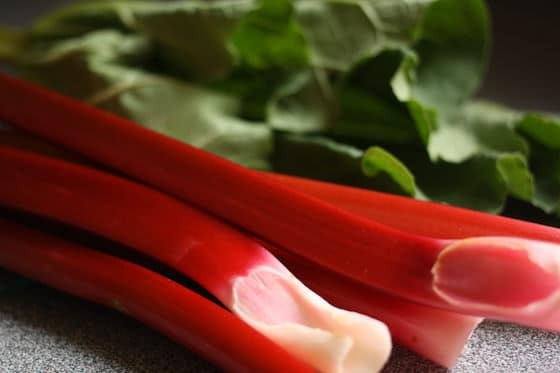 One of the reasons I love making rhubarb sauce is because it can be used in so many ways – spooned ice cream or cake, stirred into yogurt, spread on toast or a tea biscuit, or served with pork or poultry. This rhubarb compote with goat cheese is as easy as it gets when it comes to getting “fancy” with fresh rhubarb. You serve it on sliced baguette so it’s like a rhubarb bruschetta. With a handful of basic ingredients, you’ll “wow” your summer guests with this fresh and delicious appetizer. One of the most versatile ways to enjoy fresh rhubarb is to make a batch of rhubarb salsa. This rhubarb-pineapple salsa recipe is one of the best rhubarb recipes I’ve come across, and I can’t wait to make it. It’s packed with the delicious punches of flavour – lime, rhubarb, pineapple and cilantro. You can serve this salsa with so many different things – tortilla chips, baguette, fish tacos, grilled chicken or pork… The possibilities are endless! 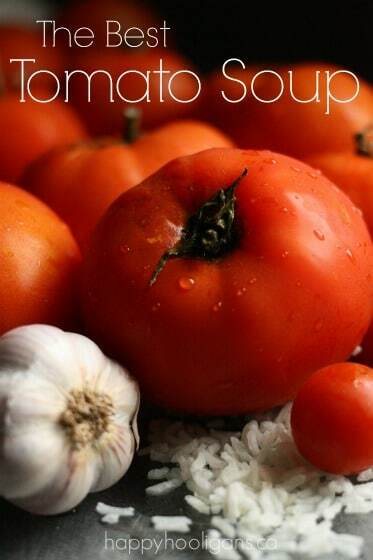 I love a chilled soup in summer time, but I’ve only ever made tomato gazpacho for my family. 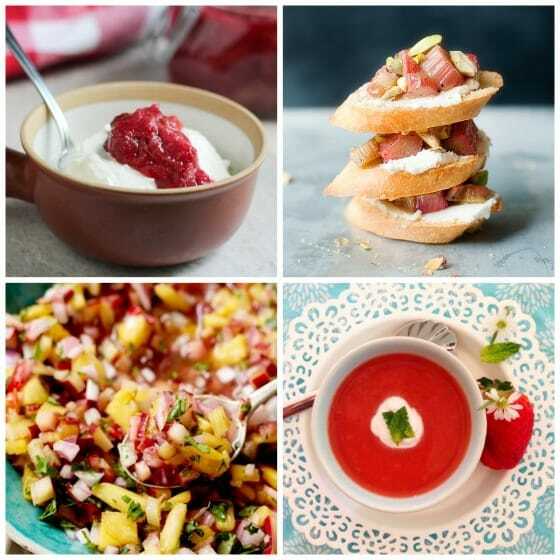 Well, I’m pretty excited to know you can make rhubarb gazpacho! Who knew? Imagine how delicious and refreshing this chilled strawberry and rhubarb soup would be as an appetizer, or for lunch or dessert on a hot summer day! Another one of my personal best rhubarb recipes is my recipe for buttermilk-rhubarb muffins. 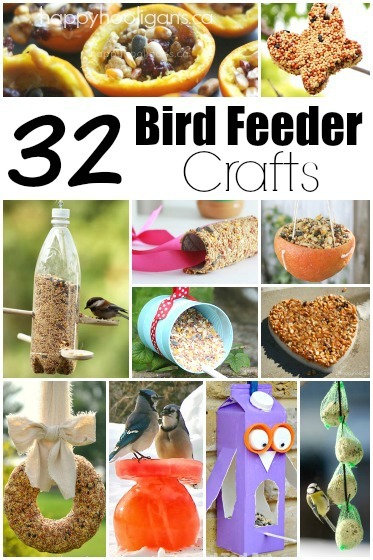 They’re easy to make and they’re so delicious! They’re the perfect blend of tart and sweet, and you can serve them at any time of day – breakfast, brunch, snack or dessert. This recipe doesn’t call for a lot of rhubarb, so it’s a good one to make if you have a neighbour that you can sneak a stalk or two from. These rhubarb cream scones call for just a half cup of fresh rhubarb. There’s no butter or eggs in this recipe. Just a handful of basic ingredients are needed to make a half-dozen for tea time. Sometimes when you’re baking, it makes more sense to make a couple of loaves rather than a whole cake. A loaf freezes nicely, and it makes a thoughtful gift for a friend or neighbour. This recipe for cinnamon-rhubarb bread makes two loaves, so it’s perfect for doing just that. Plus, when you call it bread, it means you can eat it at any meal, right? Check out the brown butter glaze! Oh My! What’s the difference between a crisp, a crumble and a cobbler? I’ve always wondered myself, so I did some digging, and discovered that while crisps, crumbles and cobblers are all baked with fruit, their toppings differ. The difference between a crisp and a crumble is that a genuine crumble does not contain oats. A cobbler differs from a crumble and a crisp in that it has a biscuit or batter topping. And there you go! Now you know! Let’s get to the recipes! Now that you know the difference between a crumble and a crisp, let’s start with recipe for cinnamon-rhubarb bread Don’t let the word “pie” scare you off. Don’t worry. You’re not making a crust. In fact, this crumble couldn’t be any easier. There are only 5 ingredients, and staying true to its name, there are no oats involved. Summer just isn’t summer without a serving of rhubarb crisp. 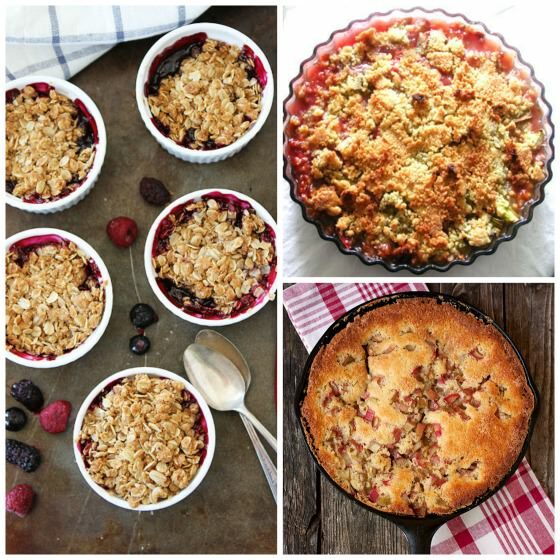 You can combine rhubarb with a number of fruits when making a dessert like this, but this particular recipe for rhubarb-berry crisp calls for a mix of blackberries, raspberries and blueberries. It doesn’t get much better than that summertime combo if you ask me. There’s nothing quite like a traditional cobbler baked in a cast iron skillet, is there? This classic rhubarb cobbler is perfect as a family dessert when you serve it with a scoop of of ice cream, but you can dress it up with a dollop of whipped cream or creme fraise for summertime entertaining. Mmmm. Bring on summer. I don’t think I’ve ever told you this before, but Creme Brûlée is the absolute love of my life. Well, maybe that’s taking it a bit far, but truly. I adore it. Recently, while on vacation, I had creme brûlée 7 out of 7 nights of the week. No lie. It’s my favourite dessert ever, so, when I discovered Rhubarb Creme Brûlée is a thing – correction – this is actually White Chocolate, Rhubarb Creme Brûlée, well um… excuse me while I pull myself back together. I’ll be trying this recipe just as soon as my own rhubarb ripens up a little more. Don’t think you have to bake your rhubarb into a traditional crisp or crumble. A pan of these rhubarb crumble squares would be perfect to take as dessert to a summer pot-luck or BBQ. Personally, I’m a huge fan of desserts that don’t come in the form of cake or pie when I’m entertaining outdoors – no plates or cutlery required! Hello…. cream cheese and rhubarb. Yeah, that’s pretty much a match made in heaven. These rhubarb cream cheese bars will take you right back to your childhood kitchen when Mom and Grandma always had a pan of something homemade cooling on the counter. These bars are easy to make, and perfect for dessert, a snack or in the lunch box. P.S. I’m pretty sure A Farmgirl’s Dabbles could be a blog entirely dedicated to rhubarb. She has a TON of rhubarb recipes on her site. Macaroons were always a childhood favourite for me, but the flavour combo of these rhubarb coconut macaroons sounds perfect for my grown up tastebuds. I can just imagine the chewy, dreamy combination of tart rhubarb and rich, sweet coconut. Put on the kettle. I feel a coffee break coming on! These lemon-rhubarb cookies will be a hit with everyone. Soft, buttery and lemony, they’re perfect to serve to the ladies with tea but they’re great for the kids’ lunchboxes too. 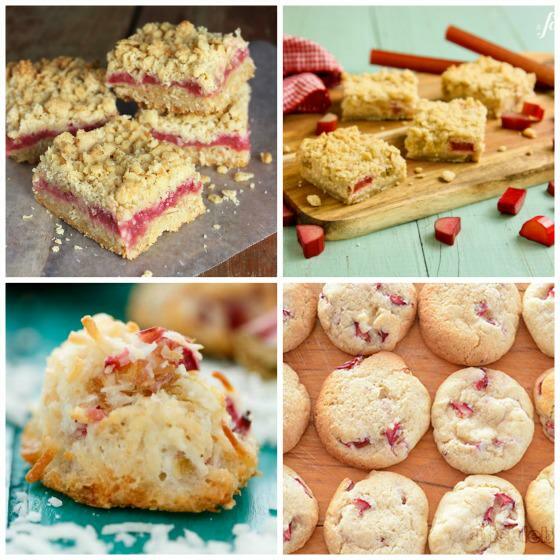 If you’ve never thought to try rhubarb in a cookie, this is a great recipe to start with. And there you go! 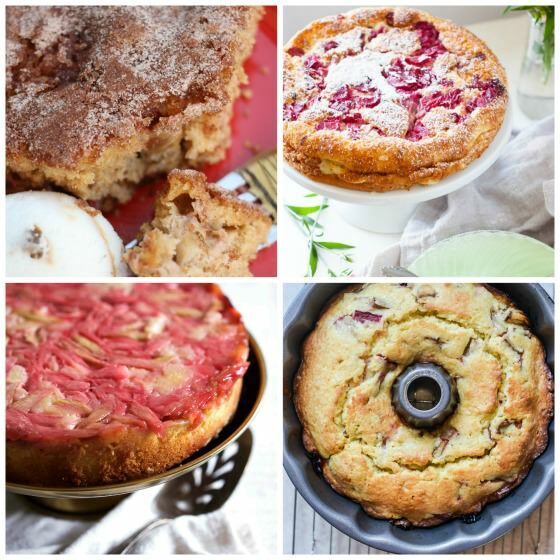 Tons of great rhubarb recipes for you to experiment with this season! Is rhubarb a fruit or a vegetable? Technically, rhubarb is a vegetable, but because we use it in desserts more than anything else, it’s mistakenly thought to be a fruit. I’ve always heard that rhubarb leaves are poisonous, so I did some Googling. It turns out that rhubarb leaves contain oxalate (oxalic acid), which is found in low amounts in a variety of foods that we eat. In high doses, it can cause health problems and even cause kidney failure. In the articles I found, the there was conflicting information about how many rhubarb leaves you’d have to eat before falling ill. My advice? Just avoid eating rhubarb leaves altogether. As if you would anyway, right? How do you freeze rhubarb? To freeze rhubarb, remove leaves and bottom ends. Wash and dry your stalks. 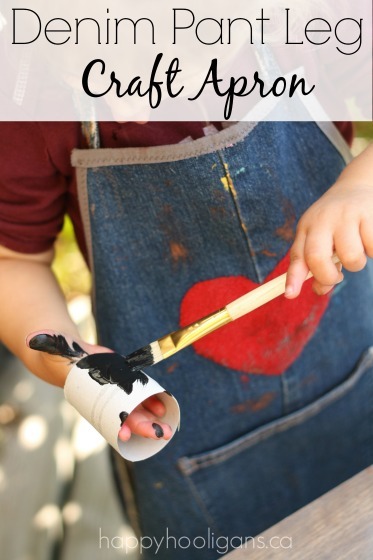 Chop stalks into 1 inch pieces and lay them out on a cookie sheet. Place the cookie sheet in the freezer for a few hours until rhubarb is frozen. Transfer into sealable bags in 1 cup or 2 cup measurements, and label the bag with the amount of rhubarb that’s in it. That way, it’s easy to know just how much is in a bag when you want to use it in a recipe. Can I substitute frozen rhubarb for fresh rhubarb? For many recipes, you can substitute fresh rhubarb with frozen rhubarb. It’s always wise to ask google though if the specific recipe you’re baking can be made with rhubarb that’s been frozen. How do you thaw frozen rhubarb? Frozen rhubarb will produce a lot of liquid as it thaws, so you’ll need to place it in a sieve or strainer while it thaws. Because of the lost juice, it’s wise to thaw a cup more than your recipe calls for. When your rhubarb has thawed, pat it dry and add it, as called for, to your recipe. Can you bake with frozen rhubarb without thawing it first? Some recipes, like muffins, and cakes will turn out fine if you add the rhubarb without thawing it first. Because the rhubarb will get quite wet while baking, toss the frozen pieces in some flour first, before adding them to the batter. This will prevent the weight of the water from causing the rhubarb pieces to sink to the bottom of the batter while baking.